Back to the 52-week blogging challenge. Today's prompt is "Honor" (although they spell it "honour"). What is honor? That's something I haven't thought a lot about. So I looked it up in the dictionary. And found it has a lot of meanings, including "the center point of the upper half of an armorial escutcheon." You "honor" someone by speaking well of them, or giving them recognition. 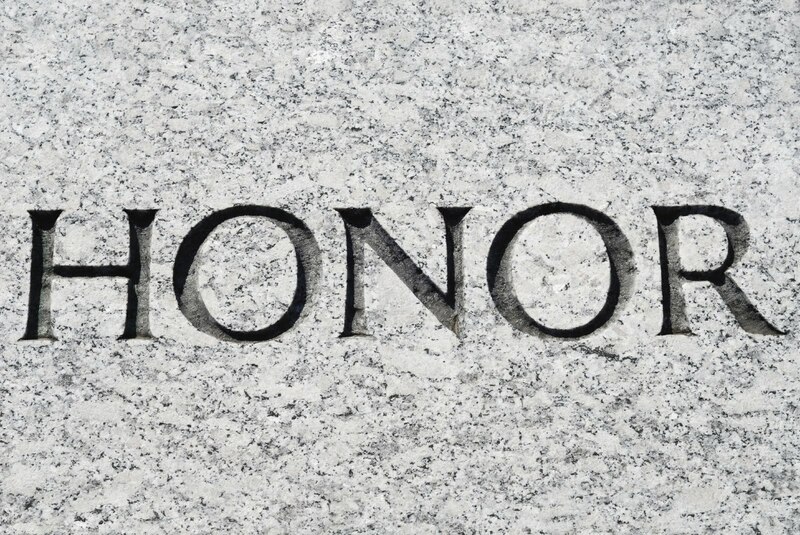 Or an "honor" could be a privilege ("I have the honor of memorializing the deceased"). Back when I was in the Army they talked of "Duty, Honor, Country." I think the use of "honor" they meant was "a keen sense of ethical conduct, integrity." Someone once said that integrity is doing the right thing when no one is looking. I always think back to my days working in customer service, doing lab tests until ten at night or later (once until three in the morning). It would have been easy to dry lab (make up and fill in the numbers) the tests. But I wanted to maintain my honor, so I did all the tests, even if I were there past midnight. And I usually got there between 7:00 and 8:00 A.M. So that made for a 16-hour day. So I keep my honor as well as I can. What do you do to be honorable? Let me know in the comments.